October 2018 | MMA Fighting Events Videos Techniques UFC Fight Picks and News. A storm has been brewing between one of the most dominant grapplers in MMA, undefeated Khabib Nurmagomedov, and one of the best strikers in MMA, Conor McGregor. That storm will be unleashed on the MMA world this Saturday October 6 at the T-Mobile Arena in Las Vegas, Nevada. 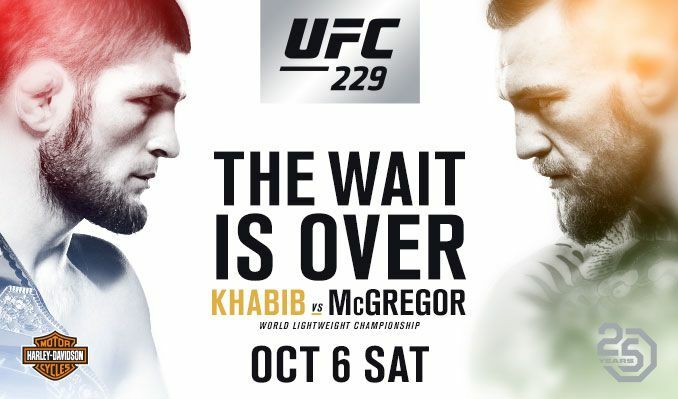 Let’s take a closer look at these two fighters and then I’ll make my official Chingasos MMA pick form UFC 229: Khabib Nurmagomedov vs. Conor McGregor. Khabib Nurmagomedov is 26-0 in MMA. He has 8 submissions and 8 KO/TKO's on his resume. Even more impressive, Khabib has never lost a round in the UFC! When fighters don’t get finished, he just mauls them until the final bell rings. Khabib Nurmagomedov is a grappling expert. He uses his stand up to set up that grappling game. He throws chingasos hard as he closes the distance and then sooner or later…usually sooner takes fighters down and dominates them until the fight ends. His striking isn’t pretty. It isn’t a classic stand up style. But, Khabib doesn’t need it to be for what he wants to do. His striking has worked well for his style. His punches come from odd angles. Those angles are setting up a clinch or a takedown. Exactly what he wants! Conor McGregor is 21-3 in MMA overall. He’s 9-1 in the UFC with that one loss coming to Nate Diaz which he later avenged. Conor McGregor won UFC titles both in the 145 lbs division as well as the 155 lbs division. His stand up is arguably the best in the UFC. McGregor has 18 wins via KO/TKO. McGregor knocked out Jose Aldo to win the 145 lbs UFC belt and knocked out Eddie Alvarez to win the UFC 155 lbs UFC belt. Conor McGregor’s stand up got him a big money boxing match with arguably one of the best boxers in history, none other than Floyd Mayweather. With only a few weeks to train and adapt to boxing rules, McGregor still went 10 rounds with the undefeated 50-0 boxing champion. These days in MMA every fighter is pretty well rounded in all aspects of hand to hand combat, mixed martial arts. But, we still have fighters that are dominant in one of those aspects. So now at UFC 229 we have this classic matchup of a grappling expert vs a striking expert. Each fighter’s strength is the others perceived weakness. While the rules of MMA have been arranged to satisfy the casual fan, who doesn’t generally understand the grappling arts, fighters who have a strong grappling background have still found a way to not only stay relevant, but dominant. This fight is going to show just how important grappling arts are in the world of MMA. Conor McGregor will rearrange his general game plan so as to stop takedowns. This will take some of his striking ability away. Conor McGregor has been a master of managing distance. His striking needs distance. Khabib Nurmagomedov is a master of taking distance away. Once he invades a fighters personal space, the fight is fought in his domain and where he is most dominant, the wrestling/grappling realm. Fighters can not out maneuver him in that realm. The fact that Conor McGregor is going to need to adjust to Khabib, and not the other way around is a telling sign of who has the upper hand in this fight. Look for McGregor to stop takedowns early. He will be successful, but he will also give up some if not all of his power striking ability. As the fight goes on, McGregor’s biggest weakness will rear it’s ugly head. That weakness is his gas tank. Grappling takes a lot of energy and Khabib’s grappling will become a huge leak in McGregor’s tank. Khabib will need to avoid that big KO McGregor chingaso! He will, and slowly but surely he will wear down McGregor with his takedown attempts. As the fight progresses, those attempts will become full on takedowns. Khabib will ground and pound his way to a victory in the later rounds.